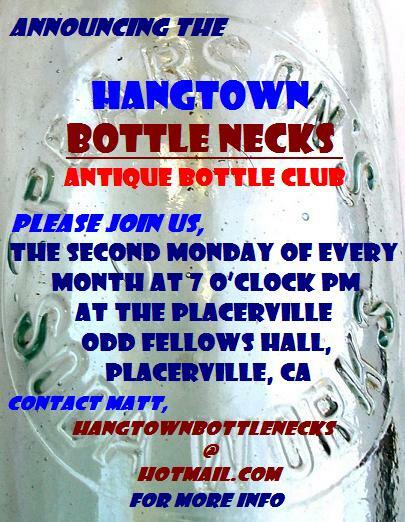 we are string up the pot down here in Placerville and attempting to resurrect the Hangtown Bottlenecks antique bottle club. Four of us got together last month and made some loose plans, set goals and elected temporary officials. I announced the club at the 49'r club meeting last night and have invited some folks locally I know would be interested. I'mn trying to get the word out to anyone who would like to come out for an evening of bottle talk, and hopefully build a foundation for a strong active club. We intend on having raffles, show and tell and guest speakers in the future, the first few meeting will probably focus on organization of the club. Maybe a show here in Placerville too? I'm hoping you could post the attached flyer and this email on your blog as I know most of the active western collectors check in. The invite is open to all, as of the moment we are not asking for due's, but if the club takes root it will be a probability in the future. Help support your local bottle club...it will help secure the future of our hobby!! Blobs & Insulators -- Kissing Cousins? How About Some Diggin' Pics!